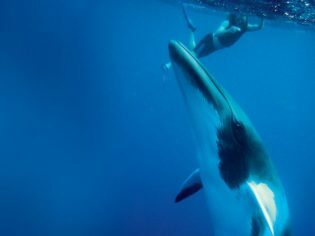 An encounter with the Queensland’s dwarf minke whales is a wildlife experience forever close to Georgia Rickard’s heart. As a rule, the great wildlife experiences of Australia tend to be tied to the great wilderness surrounding them: the exuberance of a scattering ’roo mob, say, as best admired whilst skittering across a great alpine mountainside; or the graceful beauty of a rising black cockatoo, most appropriately observed as a piece of the patchwork of a majestic Top End wetland. But the sighting of a dwarf minke whale – while still cause for excitement, wonder and the usual reflection on one’s infinitesimally minuscule place in the greater universe – does not follow this rule. You can’t train a wild animal: Divers in awe of an overhead dwarf minke whale. For the jagged landscape that greets would-be whale-sighters here, at the only place in the world where dwarf minkes congregate, is not the rugged illustriousness of the Kimberley coastline, nor the breathtaking contrast of our south-west’s icy-white beaches. Indeed it is not a landscape at all, but a choppy, navy seascape; one almost utterly indistinguishable from any other around the world, save for its location. Indeed, if it weren’t for the distant Australian coastline, which flits in and out of sight as Spirit of Freedom and her passengers meander ever further north, one could be forgiven for suspecting that you were stationary in the ocean, charging up and down the swollen surges of the Coral Sea without so much as a single degree of advancement along the global lines of longitude. But slip below the surface of that deep navy wall, and all that will prove immaterial. For the magic beneath – provided almost exclusively courtesy of these curious creatures – does more than compensate for the undulating surroundings. Swimming with dwarf minke whales might not yet be known as one of Australia’s great wildlife encounters, but, as with all truly great travel adventures, it is only a matter of time. It was only last year that 11 of Australia’s most informed travel experts voted the experience to the number three spot in Australian Traveller’s ‘100 Incredible Travel Secrets of Australia’ list; since then, the waiting list to join an expedition (a mere 200 spots are available each year) has grown ever longer. It was precisely such endorsements that prompted me to join that waiting list, then the small congregation on the back deck of this small, unglamorous ship where I stand among 25 others, shivering with excitement and some other emotion; terror, perhaps? Spirit’s head stewardess Renee is shouting out instructions to the group, a disheveled assortment of grey-haired German nature experts, backpacking Scandinavians and curious Australians, as we prepare to jump into known minke waters for the first time. Nerves are dialled up to palpable intensity in all of us. After all, how does one behave when coming face to face with a creature four times longer, and infinitely more powerful than oneself? For all our excitement at the impending interaction, however, none in our group knows terribly much about dwarf minkes. Not many people do it seems. It was only some three decades ago, on 5 August 1981, that Queenslander Rob Prettejohn first found himself eye to eye with one of these creatures. Until that point, reports of divers being approached by small, curious whales, which had white flippers with dark tips, had surfaced occasionally along the Cairns to Cooktown coastline, but Prettejohn’s interaction was the first to be recorded; a sighting of which he still holds the evidence, in the form of a rough sketch outlining their distinguishing features. Though they are rather beautiful, it is not physical features that make dwarf minkes so exceptional. Rather it is the fact that, as they return to the waters of the northern Great Barrier Reef each year, they make a point of approaching humans, with a curiosity and gentleness so extraordinary that they have earnt the moniker ‘the friendly whales’. Australian law forbids any human from entering a body of water when a whale is sighted less than 100 metres away, but dwarf minkes are so friendly that ships like Spirit of Freedom can run an entire business based on waiting for the whales to swim over to them. According to captain Tony Hazell, who has been running expeditions like these on Spirit for the past eight years, if you jump in here between mid-June and mid-July you’ve got a “99 per cent” chance of having them approach you. Quite the odds. For now, though, there are no minkes in sight. We moor off a coral-covered bommy, the mainland a distant line on sapphire, and begin throwing ourselves into the high-def underworld, while look-outs at their stations scan the seas to no effect. The three of us who’ve chosen to snorkel – the superior option for whale sighting, as floating makes our movements more predictable and thus more approachable – watch silently as the divers begin their descent to royal depths. Soon there is naught but rolling swell and fat, silvery bubble trails for company as we lift and drop over salty waves. It is rough enough to make stomachs roll, but it is also deep out here – preferred whale territory. Knowledge on these creatures may still be lacking (a point underscored by the notice on board Spirit, which kindly requests that we share any pictures we capture with the Minke Research Project), but the rules and regulations protecting them are water-tight. In the past 10 years, only nine swimming-with-minke permits have been issued by the Great Barrier Reef Marine Park Authority. Though some of those permit-holders have since ceased operation, no more permits have been issued. Indeed, only two boats make regular trips to the dwarf minke whale area from Cairns; Spirit of Freedom is one of them. Our briefing from Renee is highly prescriptive. Should the whales decide to approach, there’s to be no sudden movements, no flash photography, no swimming after them, and absolutely no touching. Disease transfer is a huge potential for dwarf minkes, she explains, as their immunity relies in part on a protective layer of mucous. And so we float, passively, maintaining easy postures but a keen lookout, hoping for whales to show themselves. And still they don’t. Minutes pass, spent staring into the dark blue fog of the distant ocean floor, as our earlier adrenaline ebbs away. Hands turn wrinkled, fingers turn white; 20 minutes turns to 30. The allure of a warm towel has just begun to tempt in earnest, when a fellow snorkeller shrieks through her snorkel. And there he is. Wandering around our general line of vision like a coquettish debutante, just near enough to let us know he’s interested. Silently he sidles closer, flirting with our heart rates, before gliding back into the darkness. The interaction lasts all of 20 seconds, but we rip off our masks and exchange exuberant observations: did you see how big he was? What about those eyes? Look-outs shout that there are more whales on approach and less than a minute later our new friend is back; this time with cohorts. The three of them zig zag and circle and dance underneath us with trademark curiosity, and it is mesmerising, confronting and oddly touching. One whale in particular – long and lean, with the skin of an oil painting and a muscular grace – disappears and returns with clockwork regularity, seeking out my eyes. His are lit with a bright intelligence that provokes surprisingly strong emotions. A previous guest of this trip had described this experience as ‘spiritual’, at which I had nodded politely – call it journalists’ cynicism. But cynicism has no place here. Even the steeliest of hearts would be floored with the joy and gratitude of this privilege, swimming mere metres from these creatures. To be here, reveling in their presence, is life-affirming. Surely it is for experiences such as this that we travel. Devastatingly, it is precisely their gentle, friendly natures that makes common minke whales – that’s the species that includes dwarf minkes and their cousins, the North Atlantic minke whale and North Pacific minke whale (not to be confused with Antarctic minke whales, a different species) – the most hunted in the world. But in these waters, says Hazell, they have no fear of us. If anything, he says, they grow only more enthusiastic about interacting with humans. Minke haven: The waters of Lizard Island, Queensland. There is much to be inquisitive about for us, too. Over the four days of our trip, which stretches north from Spirit’s Cairns homebase to the shocking aqua of Lizard Island’s waters, an ambitious 11 dives are offered up to passengers, each with its own private joy. Some, like our first minke experience, are based in rough open water, and centre around the fortune of seeing these magnificent animals. Others are a snorkeller’s paradise in clear waters of light blue silk, where clouds of exuberant fish dart amongst multi-coloured coral skyscrapers that stretch downward as far as you can free-dive. We take a kilogram of fish food to ‘the Cod Hole’ where, six metres under the sea, a proud old potato cod flexes his hierarchical authority before, once sated, allowing his younger counterparts to join the feast. We partake in an hour-long drift dive, where currents carry us along astoundingly bountiful towers of colour and movement. It is a trip that showcases the Great Barrier Reef both at the height of her glory, and in ways not often seen. But my personal highlight is a moment when, just before exiting the water on that first minke swim, my most curious observer charges. He is just metres away when he breaches, then dives underneath me, eyeing me with that bright curiosity all the way. That kind of behaviour is totally uncommon, I’m told later – but then, not much about this experience is. Getting there: The three-night ‘Cod Hole’ expedition departs Cairns every Monday, dropping you off at Lizard Island (from $1575 per person). The seven-night trip will return you back to Cairns via Osprey Reef (from $3215 per person). Need to know: The snorkelling here is excellent, so you don’t need a SCUBA licence. It’s not a luxurious ship – expect bunk beds and small bathrooms. See Spirit of Freedom for more information.